This is the second post in a series on Daily Affirmations for Women. This series takes its inspiration from a lovely book written by Elizabeth George, “Life Management for Busy Women.” The first in this series of daily affirmations for women was, “I have time for God.” These positive affirmations are pulled from a list in the book titled, “10 Disciplines for Developing a Passion for God’s Word,” so we could even consider them Biblical affirmations. Let’s get started! Oh boy! As much as I hate to admit it, the reality is, I am a woman who struggles at prayer and with prayer. I do so well…and then I don’t. And please, do not even think my struggles have to do with lack of planning. Girl, I have entire Pinterest Boards devoted to Prayer Journaling. I have planners galore and even, ahem, designed and sell a Bible and Prayer Journaling companion. So it’s not the lack of planning, paper or pens. It’s me. And the first problem is my thinking and the words I say to myself. I hit a little prayer blip and I start saying things like, “This always happens…You never…I’ve always struggled with…I’m just not good at…If only I had…If only I were…” And suddenly my little prayer blip is a molehill if not a mountain by the time everything is said and done. So when I add, “I am a woman of prayer” to my daily affirmations, what I’m really saying is, “I am a woman who talks to God (Love).” Once it’s broken down that simply, it gets a little harder to start arguing with myself and saying such nonsense as the negative self-talk above. It’s just a conversation friend. My goal is to start my day with prayer, with conversation. But sometimes it doesn’t happen. That’s ok. It really is. So we get things settled and then we pray or converse. And more often than not, how many times do we converse with our husband or friend while we’re doing something? Ok, take that same attitude and principle and apply it to a conversation with God. If I can talk over my children, while I’m folding laundry to my husband, why can’t I do the same with God? That’s right, there is no reason. With the exception of too much other noise. If I have the television blaring or the latest podcast, or some laundry folding music, then I might not be able to converse with God. It doesn’t mean any one of those things is bad, just maybe turn them off for a short period of time so we can pray. This series of considerations are prompted by the book, Life Management for Busy Women; Living Out God’s Plan with Passion and Purpose. 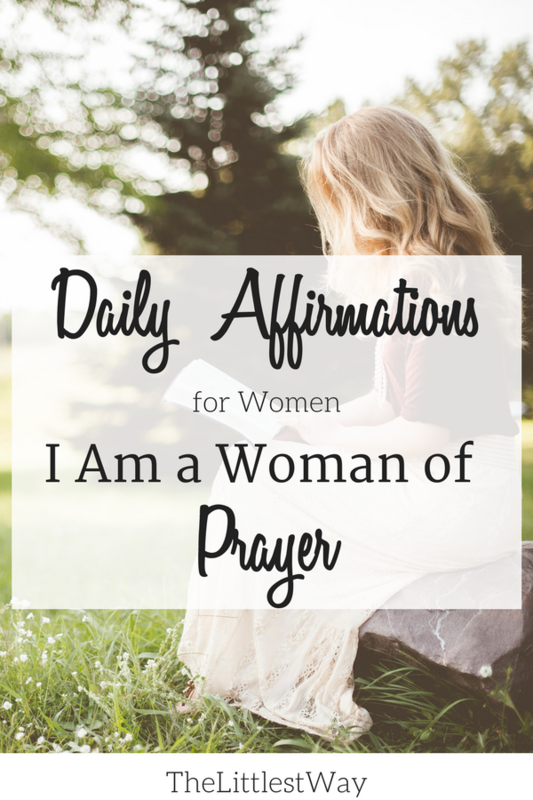 The first post in this series is Daily Affirmations for Women: I Have Time for God. Thank you for taking the time to teach and encourage us in the Truth. Thank you for the daily affirmations. More and more, it’s just a constant knowing that God is with me wherever I am. The two become one and I carry Him and He carries me. But, that comes from being in His word, every single day. And I thank you for your firm and steady encouragement.